Hoag Health Center is a non-profit health care center…which looked in to expanding further their offered services in the Orange County community, known as St. Joseph Hoag Health, includes expanding access, improving wellness and preventive services and developing more efficient methods in the delivery of care. In order to do so, the building had to increase their emergency vehicle driveways, as well as increase parking space and their facilities, which meant they had to widen the access area, modify the existing intersection to accommodate for the emergency preemption to quick in when ambulances’ where near, so traffic would be better controlled and suited. 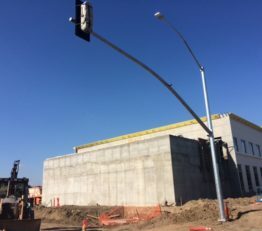 Our company installed a few more lights to the existing system, vehicle and pedestrian signals, several video detection cameras & an opticom infrared systems to provide the changing phasing required for their vision on implementing the traffic and pedestrian, as well as the emergency services paths. Opticom’s GPS System leverages highly secure radio communications to help emergency responders move through intersections more quickly and safely. The RZ-4 camera video detection is optimized for traffic detection to handle extremes in light and dark and severe glare conditions even in harsh backlit conditions any vehicle can be detected.